16th volume DVD will adapt the manga's 41st chapter where the main characters go to "Capypa Land." But both of these are really funny and amazing. The second OVA is amazing! One of my favorite aspects of Noragami is the humor and this OVA is full of it. I also just think Capypa land is a hilarious concept so the characters finally going there was perfect. Plus some romance thrown in there... I was dead. I have watched this specific OVA back several times now whenever I need that "Noragami feel" again. The first OVA is great too. While it doesn't really contribute anything to the main plot line or anything like that, it's a fun side story that brings all the main characters we see in the series together. It was fun to see how they all interacted with each other together since usually we just see yato, yuki and hiyori interacting with all those characters individually. Sometimes, you just can't help but order an extra dose of sauce to compliment your fries, some people would say fries are not eatable without any sauce, but others while thinking it's okay, a little sauce won't hurt. replacing the fries with Noragami Aragato, you can't really deny to not want any extra content to seal off your hunger for more screentime. but Noragami Aragoto OVA was a hell of a quality dipping sauce indeed! The plot of these two OVA episodes are very much a variation of a slice of life with the comedy switch turned on. There is really no heavy plot whirlpools or anything of that depth, just our characters going through some fun. 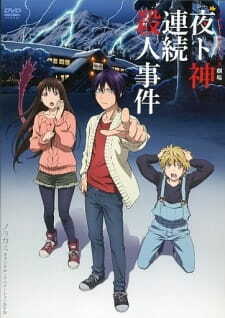 With the first episode having the whole crew go on a skiing vacation where some mysterious fella tries to kill Yato, while the latter spends time trying to capture his killer. The second OVA episode focuses on the crew going to Capypa, while Hiyori is still having nightmares from what happened there the last time she went, with Yato trying to cheer her up. I can at least thus far say, the viewers can rest assured, and not worry about the quality of the animation, because it remains consistent throughout the 23 minutes couple of episodes, nothing to bash or drag way too much here, here's an above average work of animation, just enjoy the plot. Aside from the fabulous opening and ending theme songs nothing stands out in a very memorable manner. Again, it was really great having to see those work of arts once another time. The voice acting was really well done for a comedic atmosphere. As I said before, the whole gang had the focus of this OVA, all of your lovable characters, I like how nobody was by any chance annoying. Everybody had some sort of screentime, they had the chance to speak some words and just be there for the sake of having a good time. The last season's OVA was fantastic, but this one was way more fun to keep up with, both episodes are very wholesome and engaging, I really need a third season and a good complimentary OVA too. I would differently recommend this OVA for the parent's show's fans, especial the people into comedy, I've had some great giggles every here and there. I'm intending to write a shorter review than what usually do for something small like an OVA or a movie. The art's as normal as other good anime I've seen, but I liked some of the colours used in the 2nd episode that gave some kind of emotional effect with Hiyori's sad look with the happy colours contrasting with it, including the dark background of the night sky. The sound is pretty clear and concise, and the dubs were done well, too. I like the songs for both the opening and ending of the anime, as it's really catchy and interesting. However, doesn't it feel like that the ending for Noragami Aragoto sounds like a slower, more mellow version of Kirby's Gourmet Race? I found this to be really enjoyable. The fight scenes are pretty awesome, but a change of scenery with a calm story is a nice way to feel relaxed and free from any major troubles in the anime. Overall, this was a very good anime. I will be hoping for the next season, otherwise, we wouldn't know what would be going on with Nora and her new master (can't include spoilers).